Jeff Randolph, of Randolph Group and developer of O'Neal Village, had children participating in his Dr. Seuss story. Miss Greater Easley Teen 2016 Sarah Finleyson read "If You Give a Pig a Party". Officer John Saunders of the Greer Police Department had all the children's attention. Somewhere in the back of the Little Me Academy children is Jeff Randolph. Saunders read "Brown Bear, Brown Bear, What Do You See." "I had a really great time," said Saunders. "I enjoy doing this. My wife is an elementary school teacher and I usually go to her classroom every year and read to the kids. They seem to really enjoy it." Finleyson read, "If You Give a Pig a Party." "This is actually my first time reading to kids but I've been on a few appearances to elementary schools," said Finleyson. "I just love going out in my community and volunteering. My personal goal is to teach kids that if they're confident and believe in themselves they can become anything. That's how I was able to earn my title,” said Finleyson. Randolph picked the classic "One Fish, Two Fish, Red Fish, Blue Fish”, by Dr. Seuss. Randolph chose his story because it is a favorite of his grandchildren. "My three year old grandson, I've got four grandchildren, but that's one of his favorite books," Randolph said. "He knows all of the words. I don't have to finish the sentences." The children of Little Me Academy were attentive and engaged throughout the readings and even identified their favorite characters and finished some of the lines from their favorite stories. Mandi Newton, director of Little Me Academy, said she has a smart group of three and four year olds. "I was very excited to have Jeff (Randolph) because he has helped me tremendously and has been very supportive (of Little Me Academy)," Newton said. "To get the community involvement of (Saunders), that was amazing for him to come out. Of course everybody loves a princess, and I think that was really special having (Finleyson) come out. 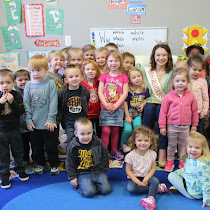 I could tell the kids really enjoyed having her read to them."